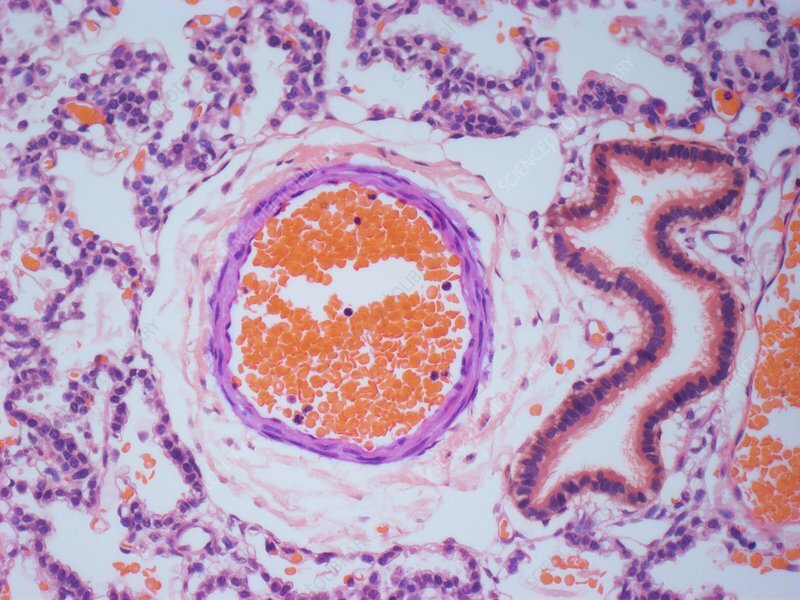 Neonatal lung, light micrograph. Immature lungs are unable to inflate properly and deliver enough oxygen to the body.This happens as a result of a combination of factors: being born early and a lack of a substance called surfactant. This helps the lungs to expand and keeps them inflated, preventing the air sacs inside the lungs from collapsing. In immature lung, the air space walls are thicker than those in mature lung due to the taller epithelium and abundant loose connective tissue. When the lung expands with the first breath at birth, the alveolar lining cells assume their characteristic flattened (squamous) shape. The interstitium contains a loose mesenchymal connective tissue. Image shows a central arteriole and a bronchiole (right center). Magnification: x 120 when printed at 10 centimetres wide.